A car crashed into a liquor store in Lanham Wednesday morning, but both the driver and the shop owner walked away uninjured. The driver slammed into Bill's Wine and Liquor on Annapolis Road about 10:30 a.m., shattering glass and crumbling part of the building. 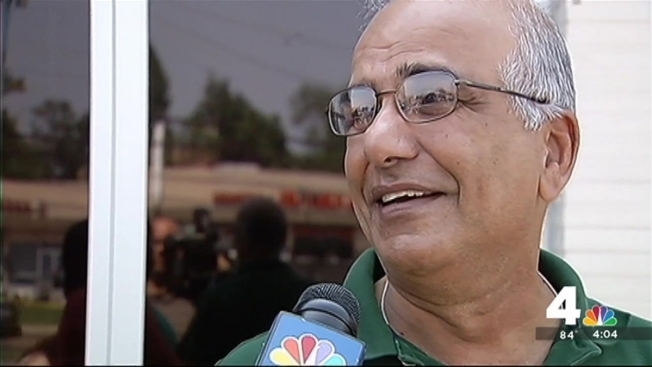 Owner Guladi Vijay was standing in harm's way just minutes before the crash, he told News4. "I was there just standing. I just went to the back to see everything was good over there and this thing happened at this time," he said. "It's a blessing for me. Lucky day." A Prince George's County Fire and EMS official said the driver told authorities she had her foot on the brake at the time of the crash. The driver was stuck in her car for a short time but was soon able to get out. Emergency responders determined she was not in need of medical attention. The vehicle was still lodged inside the store shortly before midday Wednesday. Responders were waiting to determine whether the structure was secure before they removed the car.